A brand new species of bacteria has been found by scientists among the hundreds which thrive in our mouths. The bug, named "Prevotella histicola" by its discoverers at King's College London, is thought to contribute to gum disease and tooth decay. The finding may help scientists understand the changes in bacterial activity that lead to mouth problems. Professor William Wade, from the Dental Institute at King's College London, found three strains of the new organism lurking within the flesh lining the mouth, and the name "histicola" reflects this, meaning "inhabitant of tissues" in Latin. "The healthy human mouth is home to a tremendous variety of microbes including viruses, fungi, protozoa and bacteria," he said. "The bacteria are the most numerous - there are 100 million in every millilitre of saliva and more than 600 different species in the mouth." 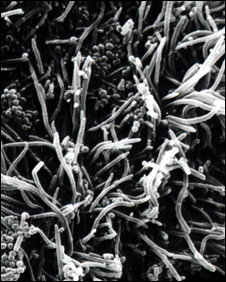 The Prevotella "family" of bacterial species have been linked to various oral diseases, as well as infections in other parts of the body. Professor Wade said that he had managed to find the new species in both normal healthy tissue and living inside oral cancer cells. "It confirms that oral bacteria can invade both tissues and individual cells." Tooth decay (caries) and gum disease are the most common bacterial diseases in humans, and other research has linked them to changes in the microbial "flora" found in the mouth. Professor Hugh Pennington, an Emeritus Professor of Microbiology at Aberdeen University, said it was important to carry on investigating the many unrecognised species of bacteria, especially those which might have the capacity to cause disease. "Many of these bacteria have not been described because they are quite hard to grow in the lab, and when you go further down into the digestive system, it gets even harder to do this. "These bacteria are thought to have an involvement in dental caries and other mouth problems, so describing them gives you a broader picture of the causation of these." He said that the constant evolution of bacteria meant a potentially never-ending supply of new strains and species. The finding was reported in the International Journal of Systematic and Evolutionary Biology.